Lord Ashdown made a speech a few days ago at the Liberal Democrats’ Scottish conference in which he more or less admitted that the only way the party are going to keep seats in Scotland is through tactical voting. He then made particular reference to the constituency of Fife North East, in which he’d been doing a bit of canvassing, and where people had apparently told him unprompted that they were Conservative by nature but were going to vote Lib Dem “because that gets the message I want”. The message, presumably, being Anything But The SNP. Ignoring the slightly holier-than-thou tone of Ashdown, who sounded like he was trying to distance himself from tactical voting at the same time as promoting it, the survival of a respectable number of Lib Dem Scottish MPs has clearly become a major concern for the party. And they’re right to be worried, as polls suggest almost all of the 11 MPs could be defeated by the SNP. But tactical voting depends on not one but two things happening: people being tactical, and people actually voting. The former is easy to do on the doorstep when confronted by people like Paddy Ashdown; the latter involves stepping over the doorstep and carrying your tactical intentions all the way into the polling booth. Lord Ashcroft has polled four of these 11 constituencies, and in each he found the SNP ahead. In one, Danny Alexander’s seat of Inverness, Nairn, Badenoch & Strathspey, the SNP polled 50%: the same total as that for every single other party combined. In Gordon the SNP were on 43%, in Ross, Skye & Lochaber 40% and in Aberdeenshire West & Kincardine it was 39%. For tactical voting to work in these kinds of situations, it’s not enough for one party’s supporters to lend their vote to another in order to defeat a third – Tory voters backing the Lib Dem candidate in order to see off the SNP, for instance. What you need, and what Ashdown perhaps fails to realise, is that you need a coalition of every other party’s supporters to swing behind you in order to have a hope of seeing off the threat. Which means Tory, Labour, Lib Dem, Green and every other non-SNP voter all joining forces. And that’s before taking into account those former Tory, Labour, Lib Dem et al voters who have already switched sides to the SNP and have no intention of coming back. 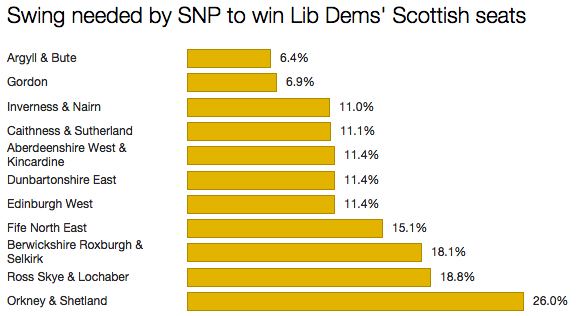 There hasn’t been an official poll made public of how the Lib Dems are doing in Fife North East. It’s Menzies Campbell seat, but he’s standing down and Tim Brett is hoping to succeed him. I gave the seat to the SNP in my latest forecast. The New Statesman’s election site May2015.com has done likewise, predicting an SNP majority over the Lib Dems of 15%. In 2010, the Lib Dems won over 50% of the vote in only two of their 11 Scottish seats: Orkney & Shetland (62%) and Ross, Skye & Lochaber (53%). But even the latter seems no longer safe, at least according to Lord Ashcroft. Paddy Ashdown appears to be trying to alternately encourage and endorse a template of psephological behaviour that has worked for the Lib Dems in England (and may do again this year) but won’t work in Scotland. It’s a model that has served his party well in elections involving three-party politics. I somehow doubt it will do likewise in a four-party fight. Ming would certainly hold this seat if he were standing. As he is retiring as are other established LD MPs, I predict SNP gain here. I think that the SNP will be fairly significant in deciding the outcome of the General Election. As they appear to be on the verge of stealing many of Labour’s seats. If this happens, it could be harder for Labour to gain power.